Why is that date significant? A group of Dutch Flickr members toured the Enschede factory in May, two weeks before it shut down; and the date code they saw on finished packs was 09/09. Note that this is actually later than the “Aug 09″ final expiration date listed in Polaroid’s own phase-out announcement. I’m a fan of the design work of Charles & Ray Eames, so I was tickled to find a film on YouTube they did for the introduction of the SX-70. It’s part advertisement, and part user guide; but also gives a cool inside look at how the mechanism works. The Polaroid images shown are nicely inspiring, though there’s a bit of a pang of loss viewing them today (especially seeing all that original SX-70 film with its turquoise “opacifying layer” being shot). The film ends with some rather cosmic commentary by Philip Morrison, who also collaborated on the classic Eames film Powers of Ten. In an earlier post, I showed how to modify a Polaroid OneStep camera so that you could take multiple exposures onto 600 film. Lately OneStep cameras have become so cheap and ubiquitous at thrift stores and on eBay that this is a creative way to reuse a few. Yet there are a couple of problems with the OneSteps. First, most models were very basic, plasticky, fixed-focus cameras, not offering much versatility. The second problem is that their frame-counting mechanism locks the shutter after 10 shots. If you’re shooting multiple exposures onto each frame, at some point you’ll need to remove the film pack in a dark room to re-set the counter, which is inconvenient. 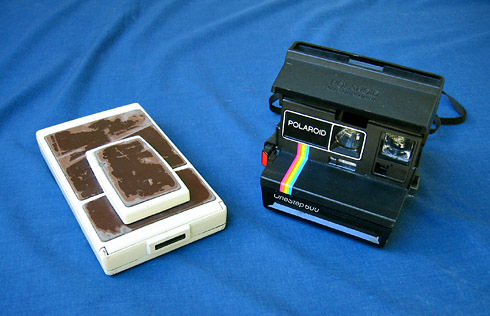 Polaroid’s SX-70 models were much more sophisticated than the OneSteps. They featured a compact, collapsible body, a good-quality glass lens, and true SLR focusing all the way down to 10″. However they’re a bit tricky to disassemble, so the “kill switch” mod I described earlier would be rather complicated to try on an SX-70. An SX-70—even a thrashed one like my white model 2—is a sleeker, nicer camera than any of Polaroid’s OneStep models. But Flickr user amalia chimera called my attention to a YouTube video by her friend Brian (whose demonstration of double-exposures on a Spectra camera I had previously linked to). In a second video he shows a technique for fooling SX-70 cameras to make double-exposures possible. Basically, the trick is this: An SX-70 has an interlock so that if the film door is open, the shutter and eject motor won’t operate. However by pressing the door-sensor lever with a narrow tool, you can take a shot even with the door open. Because the feed rollers are disengaged then, the print does not get ejected and developed. You can nudge the print back into the pack and make a second exposure. An SX-70 does require an exposure adjustment to use 600 film. But that’s a minor problem. And I would much rather shoot with an SX-70 than a cheesy OneStep, so Brian’s technique really excited me. Plus, no permanent surgery to the camera was needed. So here’s a few refinements and additions to what Brian’s video shows.